How long have you been eco-friendly? I have tried to practice eco-friendliness all my life although not 100%. I am 44, so a little familiar with old school ways of natural health and healing. Growing up, my mom would have us brush with baking soda and water, and used baking soda and a water paste as a deodorant due to allergies growing up in the summer. My mom did this to save money and also she knew of the chemicals in toothpaste and deodorant I have wavered back and forth in the past on using baking soda, but I have been using baking soda for over a year to brush my teeth rather than purchase vegan toothpaste. Pure Baking soda is natural, and in expensive. It cleans the tooth better than toothpaste filled with all the chemicals. Did you know fluoride is the chemicals that were used to make the bombs in WWII? The bomb chemicals were left over with no use, so scientists decided to make a profit and have us ingest poisonous chemicals for their pockets. For money, the dentist jumped on board in support of fluoride. In truth, studies show that third world countries where inhabitants have good teeth health did not use toothpaste of course. Good teeth health came from their diet and not sugar and processed foods. Studies have proven that a typical SAD (Standard American Diet) of sugar and processed foods causes tooth decay. We need to eat right for our health people! Even if you purchase vegan toothpaste, it can get expensive with a small oz or less tube costing $5.00. I try to clean around my home using vinegar and water at times, but have yet to integrate a full green house. I find myself purchasing some chemical cleaners, but I try to purchase more eco friendly products. Why did you choose to be eco-friendly? I chose to be eco-friendly first because of allergies to many chemicals in products. At 44, my basic skin care is just soap and water on my face. People think I'm 20 years younger than I am, but I just believe in "less is more." The less chemicals and toxins we use on our bodies and in our homes, the healthier we will be. Secondly, I became eco-friendly because I educated myself once I discovered how animals were tested just to have products for our skin care, such as lotions and soaps; as well as even using animals to taste pesticides and food preservatives. I am not 100% organic, but since I more aware through educating myself of what's in food and non-food products, I shop more eco-conscious. What do you like about it? I love being eco-friendly because it's healthier not only for our environment, but for our health. We are healing our bodies and ourselves by being eco-friendly. The fewer toxins we place on, in, and around our body...our temple...the healthier we are. Allergies, diseases, and illnesses disappear as well as cold viruses. Did you face any challenges? If so, what was/is the biggest obstacle(s)? The only challenge I faced was that my husband is not eco-friendly as I am. I had to educate and free is mind. Where I am a vegan, he is still carnivore; but, love conquers all. He has educated himself through the documentaries we watch on eco-friendliness, GMOs (genetically modified food), and vegetarianism/veganism. It's really not a challenge having a husband who is not as passionate as I am about health solutions, and eco-friendliness; but, it does offer more work to educate him to understand I want him to be healthy as we enter our 50s. I know too many family members and co-workers who passed away in their 50s too early, when a healthy vegan or vegetarian lifestyle and more eco-education could have save their lives from heart disease, diabetes, and cancer. Any tips/advice for someone looking to be more eco-friendly? Educate yourself. Read. Read. Read. View documentaries that are out there for free on Netflix on GMOs, eco-consciousness, and vegan/vegetarian lifestyles. Food Matters, King Corn, and The Gerson Miracle are movies on Netflix and also Netflix Watch It Now that will change your life forever!!! They are not geared toward vegans or vegetarians, but geared toward everyone to become informed. Misinformation is why we have failing health and a failing environment. Educate yourself. In the words of the producer of Food Matter, "It is education not medication that we need!" Going green can be complex. This discourages a lot of people. There’s really no “right” way it’s basically trying to do something than nothing at all. I sometimes feel like a green hypocrite. Do you feel that way sometimes? I do not feel like green hypocrite because I tell people that no one is perfect. In this day and age, it is hard to be 100% eco, 100% vegan, 100% anything. We are eco-friendly, vegan or vegetarian, but the only way to be 100% is to separate yourself from all of society and be self-sustaining. Having no need to take transportation, use the utility company for power or water, purchase clothes but make your own...please do not see this as discouraging but it's said to help you realize no one is perfect. No one is on a pedestal. We all must work together and work independently at the same time to be eco-friendly. No one is better than the other, but we must stand as ONE to make an eco-revolution and a health-revolution as far as veganism or vegetarianism to cure or reverse diseases. We are human, and as humans we can take a stand and try to be as eco-friendly as possible rather than be a hypocrite. Educate others. This goes for vegans and vegetarians too. I tell them to educate rather than look down on those who are not on the same healthy journey as you. Parts of being eco-friendly is also walking and getting outdoors to exercise. Do away with the gym membership, and get outdoors. 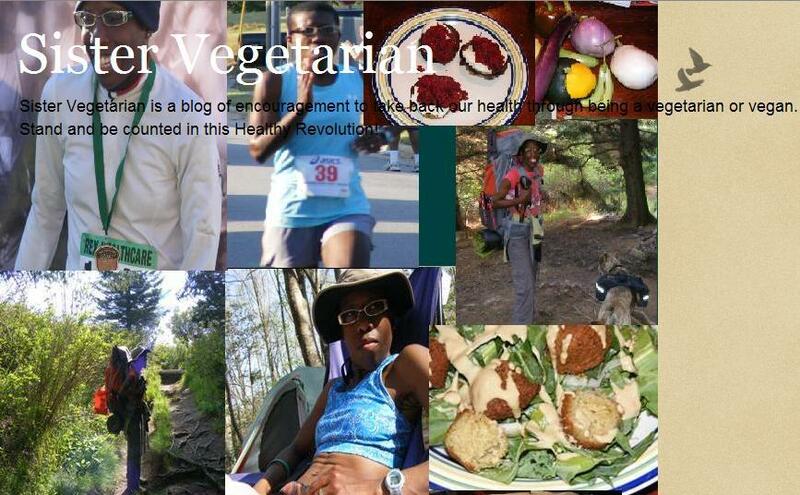 I hike, backpack in the wilderness, run long distance marathons, and walk at age 44. You know I gotta ask, How long have you been natural and how do you keep it so FLY? I have been natural 9 years and 4 months. I went natural Oct 28, 2001. Once you go natural, you never go back! Always natural-always fly-always a Nubian queen with a message for health through a vegan or vegetarian lifestyle and eco-consciousness. Is there anything you like to add? Yes, become active. Take a stand for what you believe in. In the words of Dr Martin Luther King, "If you do not stand for something, you will fall for anything." Stand up for eco-consciousness. Stand up for veganism or vegetarianism. Be proud of who and whom you are. This week, I participated in 2 protests for animals rights. Hold your head up high, and educate others. Do not preach to others, but educate others. Within the past 2 months, I have one co-worker going vegan through my education and 2-3 others considering. Education to your free your mind, and free other's minds. Here's a suggestion, read The China Study by Dr. Campbell. It is a book spanning 40 years of research on foods, health, and the environment. It's a national best seller. It will blow your mind, and open your mind. 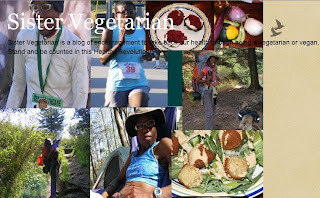 For even more information, I am coming out with a book entitle Sister Vegetarian’s 31 Days of Drama-Free Vegetarian and Vegan Living. I hope to have it out by the end of this year.